Napoleon’s Imperial Guard, and particularly his Old Guard, hardly needs any introduction. It was the elite of the French Army, much more than just the personal bodyguard of the emperor, and was filled with soldiers who had displayed exceptional bravery on campaign, been wounded, or otherwise proved their worth through bravery, patriotism, discipline and good conduct. However while they were the most capable of France’s soldiers, Napoleon was understandably reluctant to use them in action if victory could be achieved using less esteemed troops. This frustrated and annoyed the men enormously, but helped their reputation of never being defeated on the field of battle. As a result, it was much more common a sight to see such men standing around awaiting the order to advance, which often never came, than to see them in action, so despite their fearsome reputation, only destroyed on the field of Waterloo, figures such as these standing at ease present an essential view of the Old Guard not produced previously. As with other Old Guard sets produced by Strelets, these men are all wearing their greatcoats, although the adornment of the bearskins suggests they are in full dress underneath. The coats are all double-breasted and properly done here, although a few buttons seem to be missing. Naturally the coats hide most of the uniform, although it can be seen that some wear gaiters and some trousers. All have the bearskin cap of course, with metal plate on the front as well as full plume, cords and raquettes. The coats obscure the subtle changes in dress during the imperial period, so these figures are good for the whole of the 1804-1815 timeframe. The various standing poses largely speak for themselves, and all seem perfectly reasonable. A couple are taking a drink, and one man is holding an enormous pipe, but the rest are just standing around with musket in hand in apparently relaxed mood. The five poses in the last full row require special mention, and not always for the right reasons. 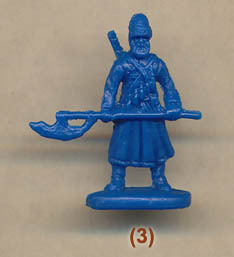 The first pictured man is a sapper, who has a musket in his left hand and an axe in his right, so cannot be using either at the moment. He holds his axe because he has not been given the necessary carrying pouch to stow it, but he has been given a metal plate on his bearskin, which sappers such as this never wore. In addition there seems no sign of the full beard such men wore with pride, although it is hard to say whether that is a design error or vague sculpting. The next man is a drummer, leaning noticeably to the right and resting his arms on his drum. This poor figure raises lots of questions, starting with how does his drum get to be held up against his abdomen like this? The strap he has round his trunk cannot be supporting it, nor should it, yet the drum is supporting his arms, so basically an impossible position. Also his exaggerated drumsticks are held by his crossbelt, but at the bottom rather than on the chest where they should be, and finally, the drum itself is very poor, with none of the necessary details but instead a zigzag pattern which seems to be a lazy alternative to doing the correct detail and has no link to any historical reality. Next in line is the standard-bearer, with his eagle and unfurled flag. He has a sword belt, but no other belt for supporting the flag, which is odd. The flag itself is limp, but seems to be about 14mm square, which scales up to about a metre. This makes it larger than the standard infantry battle flag of 80cm, and smaller than the 1815 pattern, which was 120cm square. The way the flag hangs is also odd, with the top edge drooping almost to the hand, yet the bottom edge does not appear below the same hand, suggesting it is actually a strange rectangle shape with very little height, so poorly done. The next man, an officer, is hilarious. He stands with feet together but leans so far to the right that it is a wonder he has not fallen over yet. Perhaps this is a case of too much wine or brandy, or perhaps he is surreptitiously looking round some obstacle without shifting his position, but whatever he is supposed to be doing he is a comic element that we could do without to be honest. Lastly he have the emperor himself, standing with arms folded and looking every inch the commander - a nice figure. The style of these figures is not particularly good, although we have seen far worse, sometimes from the same manufacturer. The detail is okay but not sharp, and sometimes elements like straps or bearskin cords simply disappear in places. The cross-belts are much too narrow on many, and all have over-sized epaulettes. Most of the men have a knapsack with two fastening straps rather than the correct three, and some have just one strap, over to one side. None have the long strap right round the pack, although this may be because the greatcoat is worn rather than rolled on top. All have the sword/bayonet frog, but one man has acquired a non-regulation haversack for some reason. None have a water bottle apart from the two who are currently drinking from one. The faces are fair but the hands often quite vague, and the sculpting gets quite weird in places like the second figure in the top row, who’s knapsack reaches and touches the top of his epaulette. This man also has plastic between his arms, where the mould cannot reach, and the drum, already highlighted as poor, is a part of the man, so inevitably there is a compromise in terms of shape too. Otherwise there is little excess plastic and while the seam is a bit rough and with some flash, this is not extensive. On the whole this is a solid but not particularly appealing collection of figures, although the poses are likely to be useful for many modellers. The drummer and officer leaning far to the right may reflect their political views, but we would have preferred someone more upright instead. This set provides some handy figures, but the quality of execution is not that great, which is all the more noticeable when the Old Guard has previously been depicted by some particularly beautifully produced figures.